These lightweight Royal Fluted Chef Hats are not only comfortable to wear over a longer duration of time but look elegant too. They prevent hair from falling into the food while cooking and serving. This disposable chef hat is quite useful in avoiding unsanitary hair contamination of food. These fluted paper hats in white come ready to wear and do not require any assembling. The Royal Fluted Chef Hat can fit any size with the help of a peel and stick adjustable tab. PLEATED DESIGN! 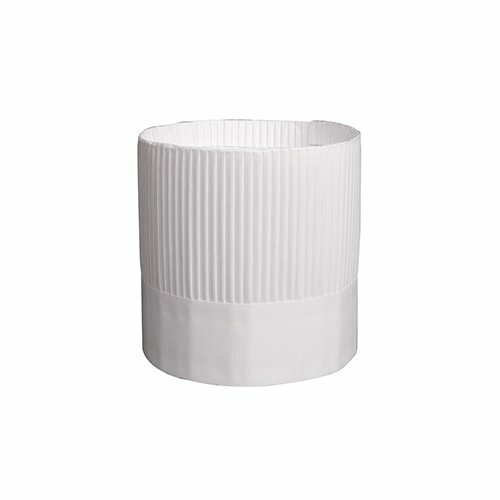 These chef hats feature an elegant, fully pleated design. They are lightweight and comfortable, and feature and peel and stick tab. FITS MOST HEADS! This product is adjustable in size, and will fit most heads. They are ready to wear with no assembly required! The height of this hat is 7". INCREASE FOOD SAFETY! This item is perfect for keeping hair out of your face, and customers food! Offered as a stylish alternative to hairnets, these hats are comfortable and lightweight. IDEAL FOR EVENTS! These chef hats are perfect for catering jobs such as parties, weddings, or conferences. They come preassembled, are lightweight, and provide a more sanitary cooking and serving experience.